The base of the dining table consists of four curved uprights inspired by our Tusk tables. The platform base has an ogee curve and silvered bronze feet. The table top has a thin subtle silver strip which adds to the top and compliments the silvered Bronze edge. This also allows for the table being dismantled for delivery to apartments with difficult access. The table seats 10. 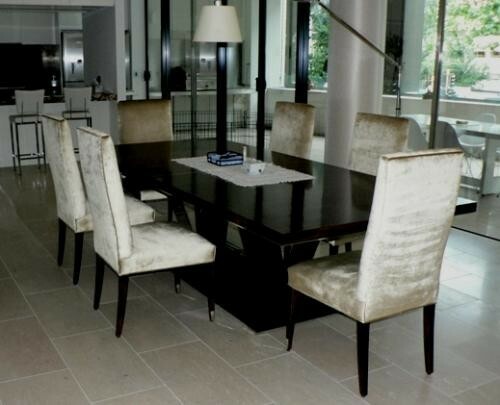 The chairs have a fine leg with silvered Bronze sabots and high upholstered back in velvet.